In the past, tracking the status of a case could take a lot of your valuable time. Now, with our online portal and our mobile app, you can enter prescriptions online, and all the information about your case is instantly accessible from your mobile device whenever you need it. Every DDS Lab customer can register with our online portal free of charge. Once you’ve registered, you will be able to use our online portal and our mobile app. Our app is downloadable on the App Store and at Google Play. What Happens Once You Register with the DDS Online Portal? Once you have navigated to Prescriptions, select the right type of prescription. Options include Crowns and Bridges, Orthodontics, Implants, and Removable appliances. Next, enter your patient’s prescription, and our step-by-step form will guide you through the entire process, ensuring that we have all the information required. Once you are satisfied with the information provided, finalize the prescription. It is now in our system, even before we have received the impression. You can print or save the prescription to easily add it to your patient’s file. What Happens Once a Case is in Progress? Once your prescriptions are entered into the online portal, you can view their status in real-time either in the portal or on a single screen using our mobile app. 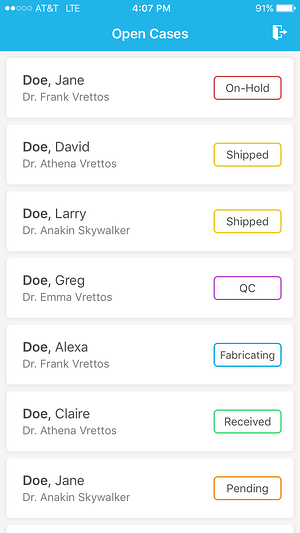 In our mobile app, the list is displayed by patient names, and the status of each open case is clearly indicated with a color-coded label. Received, QC (Quality Control), Fabricating, Shipped, or Please Contact Lab. 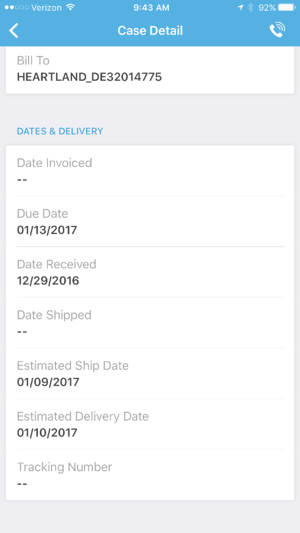 Click on the patient’s name for more detailed information, including the estimated shipping and delivery dates. If you see the "Please Contact Lab label", use the phone icon at the top right-hand side of the screen to call your dedicated Account Manager and quickly to solve any queries about a case and reduce delays to completion.